A legit, but versatile dirt jumper for groms! We’ve always been about building bikes that our own kids want to ride. Dirt jumping really grabbed our son’s attention a couple years ago, so off to work we went on a shred-worthy, jack-of-all-trades dirt jumper with a bit of flash that doesn’t break the bank. The Kotori 24” starts with A burly 6061 T6 alloy frame with a hydroformed downtube, ISCG-05 chainguard tabs and sliding, bolt on rear dropouts and a 26” X-Fusion Velvet fork with 32mm stanchions. We rounded out the package wtih Brood Bike Co.'s new A Bar Named Sue handlebars, a Tektro hydraulic disc brake out back, Brood Tenderiderz grips, the new Brood Throne pivotal saddle, sealed bearings everywhere and Brood’s new Styx 2 piece through-axle direct mount cranks and chainwheel. A legit, but versatile dirt jumper for groms that comes in at a super skinny 22 lbs. The Kotori 24” has been a proven champion in its short life! Carley Young piloted hers to a win in the dual slalom and 3rd place finish in the DH at Sea Otter 2016. 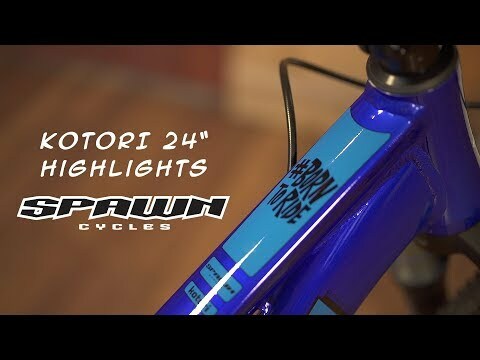 She then took her Kotori straight to the BMX track and followed up her MTB success with a W4 cruiser plate at the UCI BMX World Championships in Colombia. Not to mention, this bike was also the one under every kid who made the podium in the 10-12 age category in the Pump Track Challenge at Crankworx Whistler 2016! What can you do with a Kotori? Check it out here! What's involved in assembly? Walk through it with Fraser here!